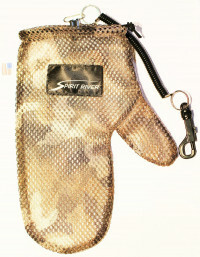 Fishtailing Mitt, Fish Tailing Glove. Comes with two snap clamps, Super-strong elastic coil that stretches out 32 inches.Mitt stays open for easy entry when fighting your fish. You can watch my videos and see this is what Grabflies has been using for years. 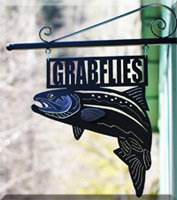 Made with mesh that is knot-less as to not scrape or hurt the Steelhead or Salmon. Much better that losing your grip and losing the fish, or have the wild Steelhead or Salmon bang itself on the rock. Also you can control the fish while getting it ready for release. A fish on it's side is in rest state in the water. A Steelhead back side up is going to swim away. With the Fish Mitt you can move a fish from it's side to back side up and reverse if it is fighting you and trying to get away. This allows you quickly to get your camera and get your hero shot. For me the clock is racing when handling wild fish - every second counts. Get your hook out and take your photo and back in the water - 30 seconds is a good turn around.